Dublin, Ireland (CNN) -- Livestock have the best views in Ireland. 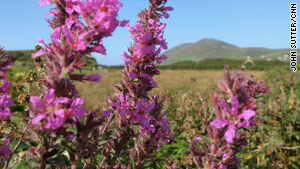 Visit any of the country's most beautiful locations -- the dramatic Cliffs of Moher, which plunge 702 feet into the Atlantic Ocean, or the island of Inishbofin, where purple mountains wrinkle the horizon and flowers grow like weeds -- and you'll see dozens of sheep, and probably cows, chewing on cud and paying paradise no attention. It's like they're completely over it. Been there. Seen that. I can't help but think visitors could learn something from these bored bovine: Stay in place, gnawing at one location for too long, and you won't see how much Ireland has to offer. That's why I'm glad that, in September, I drove a loop -- clockwise from Dublin, on the left side of the road -- around the entire Emerald Isle, taking in as much as possible in 10 days. Sure, there's something to be said for taking travel slowly in Ireland, particularly in the western counties, whose bogs are still soaked in Irish music, culture and language. Despite its reputation as a land of uniform green hills, the country is a varied and surprising place -- it's at turns modern, ancient, troubled and dripping with Guinness-induced cheer. All of it is worth seeing, and you can't take in much of it if you stay too long in one location or region. 1. Dublin (0 kilometers): At times, Ireland's capital feels like America dressed in cobblestone. After hearing "Sweet Home Alabama" in a pub, my partner and I decided to bypass present tense in favor of history. At Trinity College, see the 1,200-year-old Book of Kells, an ornately illustrated Bible. It's very Monty Python, circa "Holy Grail." The college library's Long Room, on the same tour, makes you feel like you're in a "Harry Potter" movie. It's filled with thousands of hand-sewn, dusty books -- stacked into two stories of shelves that seem to tunnel on forever. Just outside the city center, a tour of the damn and dreary Kilmainham Jail, where the British detained (and executed) Irish political prisoners, sheds light on the origins of independence. 2. Kilkenny (123 kilometers or 76 miles): This charming town is said to be the best-preserved medieval village in Ireland. The Kilkenny Castle provides an interesting example of architecture, but period-dressed mannequins lurking in the halls may freak you out. Grab a pint of Kilkenny Irish cream ale in the town center, where throngs of people chatter in narrow alleys even on a weekday. Strike up a conversation about hurling, a violent-seeming sport that involves big sticks and no pads. Kilkenny has one of the country's best teams. Go cats. 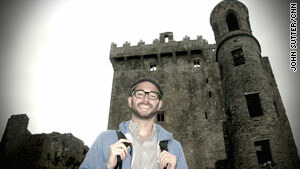 Blarney Castle is home to the legendary Blarney Stone. 3. Blarney Castle (281 kilometers or 175 miles): They say those who kiss the Blarney Stone are given the "gift of gab," meaning they become more persuasive and eloquent in their speech. I'm not sure it worked. But it was fun. A funny older man at the top of the Blarney Castle holds you in place while you lean back over the castle's edge to peck the stone upside down. It's terrifying and great. Be sure to dump the change out of your pockets before you get to the top of the castle. 4. Ring of Kerry (360 kilometers or 224 miles): The "most beautiful drive in Ireland" takes you on an all-day loop around the Kerry peninsula. It's gorgeous. We had to force ourselves to keep driving to make it back by dark -- there was just so much to see. The Ring of Kerry is full of stunning views. Stop at the possibly 4,000-year-old stone forts for a glimpse into Ireland's ancient past. It's amazing what they could build without mortar. The forts were built on hilltops so they could be used to defend territory. Views from the top of these open, circular structures are great, taking in mountains, fields of colorful heather, sheep farms and a castle that looks to have dissolved over the centuries. 5. Cliffs of Moher (503 kilometers or 313 miles): There's a sign at the edge of the Cliffs of Moher that says, "Do Not Go Beyond This Point." But you should. Tourists gather around to take pics on the far side of the sign, and you'll see dozens and dozens of people walking beyond it along a well-worn path at the top of these majestic cliffs without a rail to separate them from the breathtaking scenery. It's thrilling. Allow some time to take in the scene. The deep blue ocean is so far away that you can't even hear the waves crashing into the cliff walls. Also look for the thousands of bizarre birds -- including the Atlantic Puffin -- that make nests in the cliff walls. 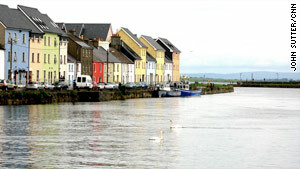 Galway, in the west, is known for its Irish music and culture. 6. Galway (574 kilometers or 357 miles): This city is steeped in music and the Irish language, so spend time in Galway's pubs even if you don't like whisky and Guinness (which, really, you should). Accordions, flutes, drums and mandolins can fire up at a moment's notice. I asked a waiter which bar was a favorite for this impromptu music, and he responded by saying, "Tig Cóilí's got mighty good crack." Turns out he was saying craic, the Irish word for "music session," not "crack" as in cocaine. And that turned out to be a great spot for live music. 7. Inishbofin and Connemara (653 kilometers or 406 miles): West of Galway is the wild, largely uninhabited region called Connemara. It's harsh and rugged --- and unmatched in its beauty. Rocky fields, jagged mountains and misty lakes dominate the scenery. We drove an hour or so west of Galway to Cleggan to take a ferry to the island of Inishbofin for views of the ocean. Inishbofin is largely clear of tourists. Stop in the small visitor's center for a map and tips on the best hikes. If you can peel your eyes from the untouched beaches, you'll find quaint farms separated by loose-stone fences. Some homes still have thatched roofs. 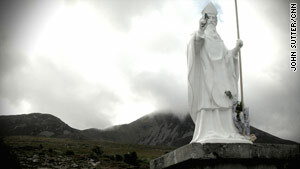 This statue of St. Patrick marks a trailhead. 8. Croagh Patrick (719 kilometers or 447 miles): "Croagh," in Irish, means hill. But St. Patrick's hill is a freaking mountain. Hiking to the top takes five or six hours, or, in our case, longer since we couldn't find the trailhead for about an hour. It's marked with a giant white statue of St. Patrick, so it really shouldn't be that hard. The steep walk has beautiful views of Clew Bay, which is dotted with hundreds of tiny islands -- one for every day of the year, they say. At the top you'll find a white chapel and the stone bed where, legend has it, St. Patrick slept for 40 days after he made the climb. It doesn't look comfortable. 9. Giant's Causeway (1,032 kilometers or 641 miles): After crossing into Northern Ireland, which is governed by the United Kingdom as opposed to the Irish Republic, we drove to the far northern coast to see Giant's Causeway, a natural wonder that is Northern Ireland's most popular tourist attraction. A golf-course green canyon wall slopes into a set of volcanic rock formations that are completely surreal: Near-perfect hexagon tubes are stacked next to each other like puzzle pieces. Walking to the end of the trail to see the Giant's Organ -- a collection of tall hexagonal pillars stuck in a canyon wall -- and The Cathedral, which is a deep, semicircular valley full of squawking birds, is well worth the views. 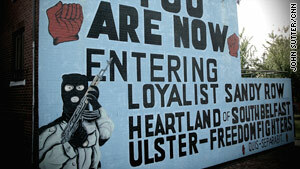 Belfast is still painted with murals from the violent "Troubles." 10. Belfast (1,128 kilometers or 700 miles): The capital of Northern Ireland still divides itself with a metal wall, topped in barbed wire -- a reminder of the violent "Troubles" that plagued the city up until the late 1990s. It's not like a quick trip to Belfast clears up all of this long and brutal history, but it helps. We took a long walk along the Peace Wall, which still separates two volatile neighborhoods, one Catholic (wanting to become part of the Republic) and one Protestant (favoring the current union with the United Kingdom). The gates between the enclaves still close at night. But it's safe in the day, and you can see a wealth of history on the walls of buildings: murals that feature martyrs of hunger strikes and glorified masked gunmen. Take a bus or taxi tour of the city at large to gain a wider-lens perspective on Belfast, which is seeing something of an economic boom and cultural resurgence.